Amaryllo is the creator of iCam Pro FHD, a small monitoring device that is able to rotate 360 degrees automatically and follow his goal to provide a complete picture of the situation. This surveillance camera is equipped with all the latest technologies, including motion sensors and light, infrared filters, microphones, WiFi and Bluetooth connectivity and a full set of real-time monitoring are included. This rotation is achieved through smart move camera design with a flat base. At the base are the two motors that rotate the camera wherever there is movement, so that you can always burn something is happening wherever they are located. It incorporates sensors that detect movement in 360 degrees around, so you will not miss a single detail. This is a device of small dimensions, which can be positioned at any angle, that is, in floors, tables, wall or ceiling. It connects to the local network via WiFi, and the company is already working on a 256-bit AES encryption to protect information that is sent to the monitoring system. It incorporates a wide angle lens 2 Mpx able to record video in Full HD (hence its name) format. 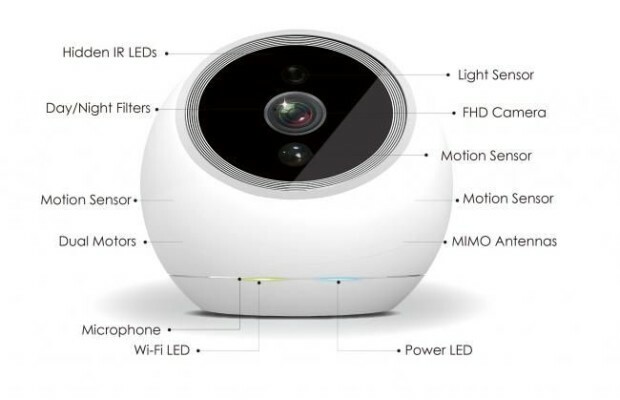 To record video in rooms with low light, incorporates its own support system based on infrared. On the other hand, has an internal capacity of 32 GB to store recordings, but also gives the ability to upload videos to the cloud through the WiFi connection. The iCam Pro FHD be presented at CES to be held in January, and is expected to be available as of May for about $ 150.